All visitors are welcome, however for a personal demonstration, please call us to arrange a convenient time so we can set up an appropriate system(s) for you to see. Please don’t turn up un-announced as we may be pre-occupied with other customers or off-site, our aim is to give you our full attention. 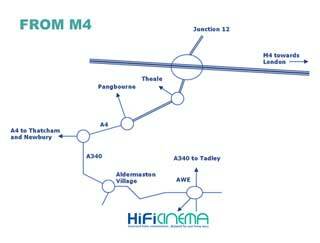 Take Junction 12 of the M4 and follow the A4 South-West towards Thatcham and Newbury. After approximately 3 miles, turn left at the roundabout on the A340 towards Aldermaston, (signposted Aldermaston Wharf) then over the swing bridge. Continue to Aldermaston village along the A340, left at the roundabout by the Hinds Head pub, up the hill until you see the AWE on your left. The AWE (Atomic Weapons Establishment) is surrounded by barbed wire fencing. Go straight across the entrance roundabout to AWE. Take the 4th exit at the next roundabout, into Calleva Park. On entering Calleva Park, bear left at the mini roundabout, take the 1st left and 1st right immediately afterwards following the orange signs for zone 4. After 50 yards, Mars House will be immediately in front of you, and HiFiCinema is on the right-hand side of the building, nearest the radio mast. Look for the HiFi Cinema Sign. Free parking is available in HiFiCinema’s private car park right outside the front door. Take Junction 6 of the M3 towards Basingstoke. Follow signs for the ringroad and the A340 along the dual carriageway. 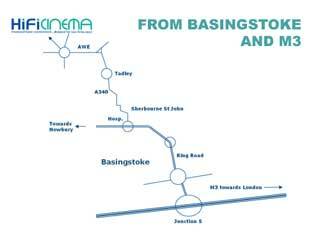 After about 1.5 miles, take the A340 exit from the ringroad (signposted Aldermaston and Tadley). Follow the A340 past the Hospital and into Tadley (about 5 miles). Continue on the A340 right through Tadley and towards Aldermaston. Bear left at the triangle shaped junction towards Kingsclere. Go straight across the roundabout entrance to AWE. At the next large roundabout take the third exit into Calleva Park. On entering Calleva Park, bear left at the mini roundabout, past the red post boxes, take the 1st left and 1st right immediately afterwards following the orange signs for zone 4. After 50 yards, Mars House will be immediately in front of you, and HiFiCinema is on the right-hand side of the building nearest the radio mast. Look for the HiFi Cinema Sign. If you are visiting us at weekends or after 7pm, there are barriers to entry into Calleva Park. Please let us know you are coming and we’ll arrange for you to be admitted.